Some people like to purchase a ready made dash or go with modern instruments in the stock dash. For this truck I wanted something different. The finished metal work can be seen in the photo below. All that is left to do is a skim coat of filler to smooth everything out. As you can see this really doesn't look much like a stock dash. But on the other hand it has a lot of similarities. The first modification was to cut out the drivers section (where the original instruments were held) and fill it in with new metal. Then the glove compartment door and frame were cut out and moved 3" to the left and welded back in place. This was to allow for an air conditioning outlet on the far right side. There was already room for one on the drivers side. Next a section was cut out of the middle lower portion for the center air conditioning outlet. With the air conditioning outlets completed the instruments locations were laid out with cardboard mockups taped in place. Once everything was set a hole saw was used to cut the openings. Now comes the fun part. A recess for each instrument was fabricated from sheet metal and then fitted into the openings in the dash. The recesses for the small instruments were angled to point directly at the driver and then tacked in place. The same was done for the large instruments and everythng was finish welded. Finally the proper size hole was cut in the dash for the Pioneer stereo. 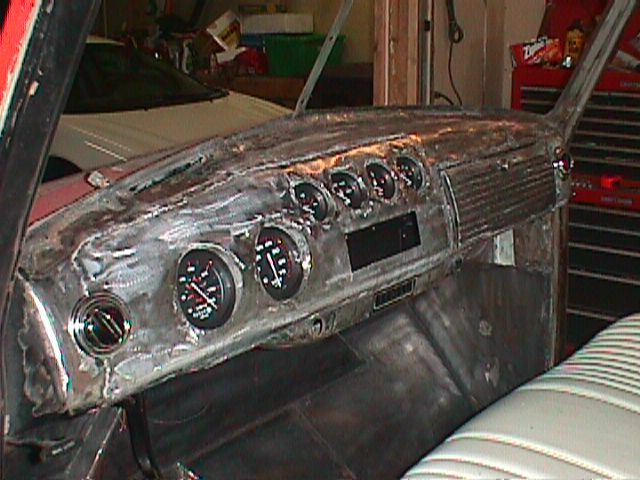 This was a lot of work but you spend a lot of time behind the wheel so the dash really needs to be laid out properly. The only thing left to do is drill holes for the light, wiper and electric antenna switches. The switches for the electric windows and air conditioning controls will be located in an overhead console later.